or call today 1-800-949-6100 for more information. 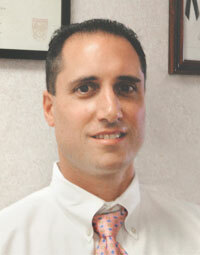 Dr. Gregorace offers orthopedic care and rehabilitation for employees hurt on the job. The goal is not only to heal our clients but get them back to work. Dr. Gregorace understands the workers compensation system and can provide all the information a patient needs to file his or her claim. Dr. Gregorace completed his medical school education at New York College of Osteopathic Medicine. He went on to train at Rusk Institute of Rehabilitation Medicine of NYU Medical Center where he was chief resident during his senior year of residency training. Dr. Gregorace is board certified by the American Board of Physical Medicine and Rehabilitation and by the American Academy of Pain Management. He is also a Fellow of the American Academy of Physical Medicine and Rehabilitation and a member of the American Academy of PM&R Research Review Committee. He has written numerous articles for The Physician and Sports Medicine and Practical Pain Management on a variety of topics within musculoskeletal medicine. He is currently conducting research on the efficacy of prolotherapy for the treatment of chronic low back pain. Dr. Gregorace is a faculty member at Long Island Jewish Medical Center, Department of Rehabilitation Medicine. He has been in private practice since 1997 and has special interests in chronic pain management, musculoskeletal medicine, neuropathic pain and prolotherapy. After more than a decade's experience, Dr. Gregorace believes that the osteopathic manual medicine approach to Physical Medicine & Rehabilitation affords him the unique ability to understand the musculoskeletal system and its pathology better. His patients benefit from a "hands-on" approach to treatment, using osteopathic techniques in conjunction with traditional rehabilitation medicine treatments. Dr Gregorace New York Workers Compensation Doctor has offices in both in Hempstead, NY and Bellmore, NY. Contact a Hempstead,LI, NY Back and Neck Injury Doctor Today! If you've been injured on the job accident from a scaffold fall, machinery accident, fall from a ladder, falling object, vehicle accident, or an injury from heavy lifting... YOUR WORKERS COMP BENEFITS ARE AVAILABLE TO YOU!